I just got back to Boston after almost a week away on Cape Cod and the Vineyard. 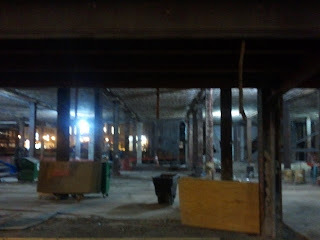 While walking through Downtown Crossing this evening I noticed that the place where Filene's Basement used to be is now only empty space; but somehow the rest of the building on top of it is still there. I never realized it was possible to remove the bottom floor of a building without everything above it falling down. This picture doesn't really do it justice (the whole thing reminded me of some crazy giant sized game of Jenga), but it's the best I could do while holding my cell phone up over the chain link fence surrounding the area. It's a bizarre feeling to look straight through a building and see the store signs a block away on the other side. And like I said, I've been on vacation for the last six days, so I realize my content has been a little sub par of late.